When AMSOIL synthetic motor oil was introduced in 1972 it stood in stark contrast from its conventional-oil counterparts. Pioneering the use of synthetics, the concept of extended drain intervals and the practice of formulating a highquality product up to a performance standard rather than making it “just good enough” were all new ideas then. Today, nearly every other oil manufacturer offers a line of synthetic products, and a few even offer extended-drain oils. To be sure, AMSOIL has impacted the industry. But while the other companies play catch-up, AMSOIL has continued to innovate and improve its products to ensure it remains at the forefront of the lubrication industry. In fact, current trends only reinforce the idea that AMSOIL is perfectly positioned for continued growth. The new API SN, ILSAC GF-5 and dexos1™ specifications were introduced in the fall, mandating improved fuel economy, oil robustness and emissions system protection. The dexos1 and GF-5 specifications are designed to address the unique demands presented by modern turbocharged engines and engines running on ethanol fuels (E85). Because a number of GM engines with variable camshaft timing use motor oil as a hydraulic fluid, the dexos1 specification also requires increased resistance to aeration. The main objectives of the new specifications are to improve protection for modern vehicles and squeeze as much additional fuel economy as possible out of motor oil. As the leading synthetic lubricant manufacturer in the industry, AMSOIL products were already ideal for meeting these objectives. Nonetheless, AMSOIL OE and XL Synthetic Motor Oils are API SN and ILSAC GF-5 licensed, and OE 5W-30 (OEF) and XL 5W-30 (XLF) are recommended for applications requiring the dexos1 specification. The top-tier line of AMSOIL synthetic motor oils is being repackaged to reflect the latest industry specifications. Because each new industry specification provides an increased level of protection and performance over the preceding specification, most oils require higher quality, more expensive base stocks and additives. Combined with the increased costs associated with research and development and licensing fees for the new oils, motor oil prices have steadily increased over the past few years. In fact, GF-5 oils cost about 15-20 percent more than GF-4 oils, while dexos1 oils carry an average 25-30 percent price premium. AMSOIL offers the most cost-effective motor oils on the market. While the initial price of an oil change using an AMSOIL XL or top-tier motor oil costs more than a conventional oil change, customers dramatically reduce their annual motor oil costs by taking advantage of extended drain intervals, and save even more through improved fuel economy, reduced vehicle maintenance and extended vehicle life. While the 3,000-mile oil drain interval was the standard for many years, a single oil-drain standard based on mileage no longer applies. The industry has seen vehicle manufacturers recommend increasingly longer drain intervals over the past several years, and motor oil manufacturers have had to keep pace. In fact, Ford recommends 10,000-mile drain intervals with its 2011 vehicles, while vehicles equipped with electronic oil monitoring systems often extend drain intervals up to and even beyond the 10,000-mile mark. Of course, while many customers follow the oil change recommendations set by their vehicle’s manufacturer, many continue to practice the 3,000-mile drain intervals recommended by many installers. AMSOIL pioneered the concept of extended drain intervals back in 1972 and remains the industry leader. The company offers an oil for every type of customer, whether they follow 3,000- mile intervals, OEM-recommended intervals or extended drain intervals. 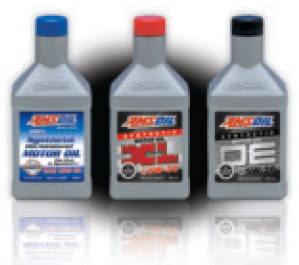 OE synthetic motor oils are formulated for today’s OEM-recommended oil drains; XL synthetic motor oils are formulated for 10,000-mile/six-month drain intervals, or longer when recommended in owners’ manuals or indicated by electronic oil life monitoring systems, and the top-tier AMSOIL synthetic motor oils are formulated for 25,000-mile/one-year drain intervals. People are looking to save money wherever they can in today’s economy, and an increasing number of customers are motivated to seek motor oil sales or shop around for the best price. In fact, even as the popularity of synthetics continues to grow, data indicates 92 percent of synthetic motor oil customers purchase lower-priced products recommended for standard drain intervals. AMSOIL OE synthetic motor oils are ideal for cost-conscious customers who want the benefits associated with a synthetic, but won’t pay a significantly higher price than a conventional product. OE is recommended for original equipment manufacturer (OEM)-recommended drain intervals and serves as an excellent entry-level product for customers. Once they experience the benefits, they are prime candidates for moving up to the XL or top-tier line of AMSOIL synthetic motor oils to save even more through extended drain intervals. XL Synthetic Motor Oils are recommended for 10,000-mile/six-month drain intervals, while the top-tier line is recommended for 25,000-mile/one-year drain intervals. When examining current trends in lubrication, it’s easy to see how AMSOIL has led the charge. New specifications are forcing quality up, drain intervals are getting longer and consumers are searching for the most cost-effective methods of maintaining their vehicles – all hallmarks of AMSOIL products. I thought I’d drop you a note since I’m pretty excited. I switched all three of my trucks to AMSOIL products over the last few days: engine oil, transmission, front and rear differentials. The news is about my tournament truck. I have a 2011 Ford F250 with the new diesel engine. Before I made the lubricant switch, I filled the truck with diesel and headed to Duluth (Minn.) to get some work done. I was bucking a head wind and got 17.8 miles per gallon, which is pretty normal going against a 30 mph wind. I got the lubricants switched and some other work done on the truck, so it stayed overnight. The next day I came back with my wife’s truck to get her lubricants switched. That day we drove both vehicles back home, and this is where it got interesting. The wind was dead calm and I wanted to see what happened to the gas mileage, so I drove the speed limit and used the speed control on the truck most of the way. I’ve made this trip from Duluth to my house many times where I tried to get the best gas mileage, probably no less than six times when I was watching closely. The best mileage that I ever got on the stretch between Duluth and Ashland (Wis.) was 20.4 mpg, and since the stretch between Ashland and my house is really hilly, the mileage goes down and the best overall performance when I reach my house has been 19.4 mpg. Using the same diesel fill as when I took the truck to Duluth, I got 22.4 mpg from Duluth to Ashland and 21.3 when I got home! That’s almost two miles per gallon better by just switching to the AMSOIL lubricants! I would have never believed that it would have made such a difference, especially since Ford uses synthetics in the new diesels already. All I can say is WOW! The machine may be consuming more oil than is needed. 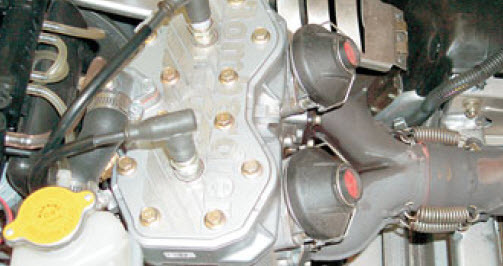 Oil injection pumps vary the amount of oil injected based on the throttle position. As the throttle is opened, oil consumption increases. AMSOIL 2-Cycle Oils are recommended for use at 50:1 mix ratios, but if the sled is consuming more than one quart of oil per 12 gallons of gas, it is exceeding an average mix ratio of 50:1. The less oil the sled burns, the fewer the deposits that accumulate on the exhaust power valves. If you wish to have a sled’s oil injection pump setting checked, AMSOIL recommends bringing it to a local dealership so a qualified snowmobile mechanic can make the correct adjustments. Another contributing factor to excessive deposit build-up is riding style. Snowmobiles operated at low speeds and/or steady RPM for extended periods of time will accumulate deposits more quickly than snowmobiles operated at higher speeds. Two-cycle motors do not operate at maximum efficiency at slower speeds, causing a large percentage of unburned fuel and oil to exit through the exhaust. This unburned material accumulates on exhaust valves and forms deposits. 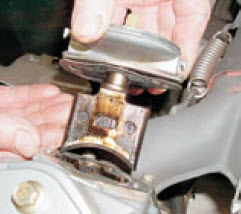 Also, since snowmobiles operated at low-level constant RPM do not frequently actuate the valve, it allows deposits to form more rapidly, requiring more frequent valve maintenance. Snowmobiles run at higher RPM operate more efficiently and can extend time between valve cleanings. Efficient operation results in increased combustion temperatures and more complete burning of the oil/fuel charge. Higher RPM also means the exhaust power valve is more frequently actuated, disrupting deposits and slowing down their accumulation. It is a time of increased awareness. We’ve seen fuel prices in a constant state of fluctuation over the past few years, and it has caused us to seek ways to get more for our gasoline dollar. At times, prices have climbed high enough to cause many people to alter their driving habits, including the cancellations of vacations and long road trips. All of this has served to make Americans more aware of our nation’s dependence on foreign oil. Now is also a time of renewed patriotism and desire to “buy American.” How can using AMSOIL synthetic lubricants increase fuel economy and help decrease dependence on foreign oil? Refined petroleum-based lubricants are composed of irregular molecules of various sizes. As the molecules slip across each other, they create friction which adversely affects both wear protection and fuel economy. AMSOIL synthetic lubricants, on the other hand, contain only smooth, uniform molecules which easily slip across each other, effectively keeping friction to a minimum. This allows fuel to be diverted from the task of overcoming friction to reaching the drivetrain, decreasing overall fuel consumption. Conventional lubricants are also very susceptible to volatility. When their lighter molecules “boil off” during hot operating conditions, the oil becomes thick and more difficult to pump, consuming more energy and reducing fuel economy. Because AMSOIL synthetic lubricants contain uniformly sized molecules, they lose very little to volatility and keep fuel economy high. AMSOIL synthetic motor oils, gear lubes and drivetrain fluids consistently yield increases in fuel economy. Industry tests demonstrate that an average passenger car can conservatively decrease its fuel consumption by two to five percent by switching to synthetic lubricants, while independent testing shows that trucks can decrease fuel consumption by 8.2 percent. Many AMSOIL customers report even larger gains in fuel economy. Based on 1998 Domestic Fuel Consumption data, American cars consume 72 billion gallons of gasoline per year. If all these vehicles switched to using AMSOIL synthetic lubricants and gained a five percent increase in fuel economy, America would save a staggering 3.66 billion gallons of fuel. That’s enough fuel to drive to the moon and back more than 163,000 times. It’s enough to drive to the sun and back 420 times. By taking advantage of the extended drain intervals of AMSOIL synthetic lubricants, oil usage is also significantly reduced. People can reduce the amount of oil they use by as much as 80 percent by switching to AMSOIL. Where does all of that Motor Oil go? Volatization, the methods used to test it, and why AMSOIL decided consumers would care. 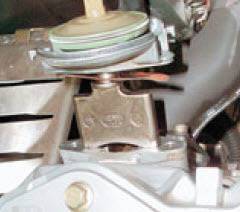 When speaking about their vehicles, motorists may often comment that their auto “uses a little oil now and then.” Although many are positive that the vehicle is “using” this oil, upon further questioning they often cannot explain how or why or where exactly the oil dissappeared. Is it leaking? Certainly some vehicles will leak an amount of oil out of seals, gaskets and joints. But others that “use” oil have no leaks at all. So where does this oil go? The oil goes through a process known as volatization, and it can end up costing motorists more than just the price of a few quarts of oil. This “chemical soup” found in standard petroleum mineral oils contributes to many of their shortcomings when compared with synthetic oils. Because these molecules prevent uniformity, the oil has a tendency to deteriorate more rapidly. If lighter fractions are present in the oil, they can boil off (or volatize) which leads to oil consumption, oil thickening and a loss of performance. A Fractioning Tower can separate the useable portions of crude oil to obtain common end products. Even though many motorists do not realize it, when they notice that their vehicle is “using” oil they are often witnessing the effects of volatization. Most simply buy extra oil to replace what they assume the motor has “used” and check regularly to see if the level is low. But is adding more mineral oil necessarily the best solution to the problem? What they may in fact be doing by adding more petroleum-based mineral oil is burning up their money. For example, if an automobile needs five quarts of mineral oil sold at $2 a quart to operate during a 3,000- mile drain interval, and the mineral oil used in the vehicle volatizes and is replaced at a rate of one quart every 1,000 miles, the automobile actually goes through 7 quarts of mineral oil during the drain interval and the motorist spends an extra $4 per oil change interval on “topping off” the levels. Considering that the average vehicle puts on 15,000 miles a year, $20 in extra oil is used to keep the oil levels sufficient. But extra oil is not the only expense motorists face when dealing with volatization. As motor oil goes through the process of volatizing, the chemically lighter (or more volatile) portions are always the first to “boil off” in the oil. This leaves the heavier, less pumpable portions behind. This heavier oil cannot be relied upon to flow easily and quickly to all of the engine components. The end result is decreased fuel efficiency, premature component wear and deposit formation within the engine. The expense to the motorist can be quite substantial. This is the NOACK Volatility Test apparatus. An oil sample is weighed before the test procedure is begun and after the test is completed. The amount lost by weight, due to volatility, is reported as a percentage. 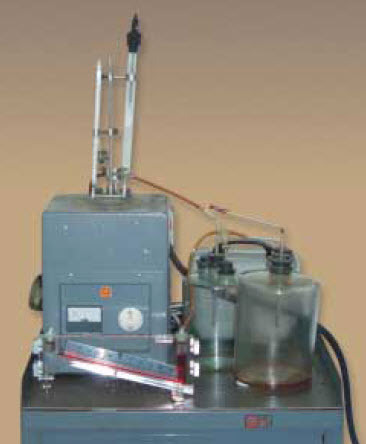 The gray box houses the oil sample, which is heated to 150°C (302°F). Dry air is passed over the sample carrying off oil vapors with it. The beaker on the right receives the oil that has “boiled off.” It works somewhat like a petroleum fractioning tower or still. Acceptable percentages of loss by weight are determined by the grade and weight of the oil that is being tested. Synthetic motor oils have a natural advantage over petroleum-based oils when it comes to volatility. This is because synthetic oils are designed to have uniform chemical structures. This eliminates the extra chemicals and hydrocarbon structures (or “chemical soup”) found in oils based only in mineral stock. Because they contain less lighter chemical portions to boil off, synthetic products lose less of their lubricating abilities to volatization. AMSOIL Synthetic Motor Oils maintain their viscosity and provide ongoing cold start protection, fuel efficiency and reduced oil consumption. Surprisingly, volatility was not always considered when comparing motor oils. 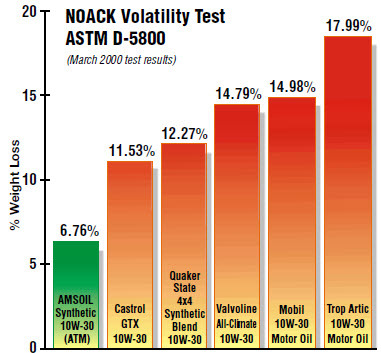 Few oil companies published test results measuring an oil’s volatility until the 1980s, when AMSOIL became the first in the United States to publish NOACK Volatility Test results. In the NOACK Volatility Test the oil is heated to 150° C for a specified period. 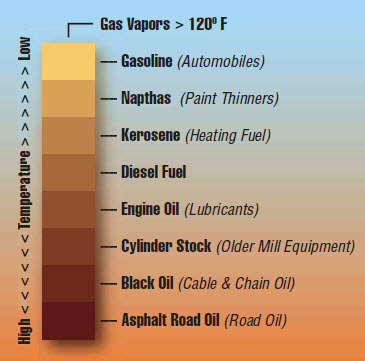 Lighter oil fractions will “boil off,” leading to oil consumption, oil thickening and a loss of performance. The percentage lost, by weight, due to this “boil-off” is reported. The test has different passing requirements depending on the weight of the oil being tested. For example, 10W-30 oil in the United States may lose up to 22 percent, by weight, and still be “passable.” However, with 20 percent gone, the oil suffers significant performance deficits in characteristics such as pumpability and lubricity. Effective July 1, 2001, a new specification, known as GF-3, allows a maximum of 15 percent loss. European standards, which have been stricter for years, already limit high quality oils to a maximum of 13 percent loss. AMSOIL 10W-30 loses only 6.76 percent to volatility. AMSOIL reports these results because they enable informed consumers to understand the value offered by synthetic motor oils. Low oil volatility means reduced oil consumption rates, maximum fuel efficiency and higher levels of performance for longer periods of time. These are the results of a typical NOACK Volatility Test. Improvements in the field of lubrication have led to increasingly lower weight loss percentages for all types of oil. However, synthetics have generally always outperformed mineral oil based lubricants. AMSOIL synthetics consistently boast lower loss by weight percentages than competitors’ oils. Author johnzenaPosted on October 11, 2010 Categories General Motor Oil News, UncategorizedLeave a comment on Where does all of that Motor Oil go? The buzz around the diesel truck industry these days concerns the new pollution regulations set to go into effect in October 2002. Although many engine manufacturers and fleet operators remain unsure of how they will meet the new requirements, the general assumption has been the incorporation of exhaust gas recirculation (EGR) units, which would recirculate a portion of the exhaust to the engine’s combustion chamber to incinerate pollutants. But although EGR units would seriously reduce levels of nitrous oxides and particulates in diesel exhaust, they would also significantly increase the amount of soot in engines, possibly forcing fleet operators to cut back on oil drain intervals. With the goal being to “meet the needs of EGRequipped engines while maintaining current oil drain intervals,” the American Petroleum Institute (API) is working on the next category of heavy-duty engine oils, PC-9. However, because of widespread belief that the new oils will not be ready by October 2002, trucking companies are faced with either developing their own internal specifications or using current CH-4 diesel oils. Unfortunately, the use of petroleum CH-4 diesel oils would likely force fleet operators to backtrack on drain intervals, something the industry has been working to lengthen over the past few years. While fleet operators have been assured everything will work out in the end, worries over emissions regulations have just begun. The Environmental Protection Agency (EPA) has scheduled even tighter regulations to take effect in 2007, including a 95 percent reduction in nitrous oxides and particulates and a 90 percent reduction in soot. In order to help meet these new goals, the EPA plans a 97 percent reduction in the sulfur content of diesel fuel in 2006. The 2007 mandate will be much more difficult to meet, probably impossible unless major changes are made in diesel systems. “Until now, we’ve been meeting regulations by tweaking engines – doing things like exhaust gas recycling or turbo-charging,” said Joe Suchecki, director of public affairs for the Engine Manufacturers Association. “But we’ve reached a point of diminishing returns for those kinds of fixes and we’re going to have to turn to things like ultra-low sulfur fuel and exhaust aftertreatment. Danny Larkin of Detroit Diesel believes 2007 engines will boast a very advanced design, featuring advanced combustion properties and designs that will make the soot problems of 2003 engines a thing of the past. The corresponding diesel oils will also be formulated much differently than today’s oils, with an emphasis on deposit control. If such solutions come about, it could negatively affect the trucking industry in a variety of ways. New after-treatment systems could add $2000 to the price of new vehicles, and reducing the sulfur content in diesel fuel would undoubtedly raise fuel prices. Of course, there’s also the previously mentioned issue of non-backward compatibility in diesel motor oils to consider. The trucking industry has time on its side. With six years in which to work, many operators hope engine makers will find a workable, affordable and easily implemented solution. Of course, there’s also the possibility the 2007 regulations will be amended before going into effect. With a whole new emphasis on emissions reduction in the diesel trucking industry, premium quality diesel oils will be needed to keep emissions down, control soot and acid levels in the crankcase and maintain longer drain intervals. AMSOIL Diesel Oils offer the ultimate diesel engine protection and performance. AMSOIL Diesel Oils resist oxidation and thermal breakdown, reducing emissions while maintaining viscosity and eliminating sludge and varnish formation. The special performance additives of AMSOIL Diesel Oils effectively control acid and soot, and their extended drain capabilities reduce downtime and oil expenses.